In the spring of 1992 a young Christian Bale was starring in this little Disney motion picture called Newsies and, for being a Disney production, it didn’t get much fanfare or response. However, there were quite a number of die-hard Disney fans who loved it making it a success… not a blockbuster hit, but a success none the less. 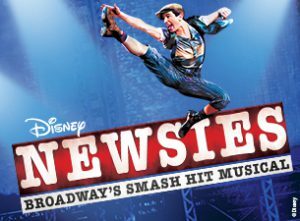 Fast-forward 20 years to 2012, almost exactly 20 years later, to the date (give or take a month) Disney’s Newsies with Music by Alan Menken, Lyrics by Jack Feldman, and Book by Harvey Fierstein opens on Broadway and is an instant success with a hefty run of 1004 performances. Disney’s Newsies closed it’s Broadway run in August of 2014 but, fear not, Baltimore! Third Wall Productions have picked up the torch and are presenting it as their latest offering, Directed by Henry Cyr, with Music Direction by W. William Zellhofer and Choreoraphed by Mother-Daughter team Cecelia DeBaugh, Lucy DeBaugh, and Maia DeBaugh, and it’s a quite enjoyable evening of theatre. Briefly, Disney’s Newsies concerns itself with the “newsies” or newspaper sellers on the streets of New York City near the turn of the 20th century. Work conditions are horrible (not only for newsies, but for children all over the city) and the newsies have to buy the papers they sell. When Mr. Pulizter, owner of most of the newspapers in the city, decide to raise prices for the newsies, with the help of an unbeknownst highly placed friend, they newsies decide to go on strike, making the front page and practically crippling the entire city when other children from other professions decide to join. This production takes place in a sanctuary of a church, but with the splendid Set Design by Pat Rudai and Jordan Hollett, the audience is transported back to the summer of 1899 in New York City. The design is a clean unit set with levels and balconies that keep the staging interesting and moving nicely. Simple set pieces are brought in to represent various locations and this design is a good example of less is more. A special shout out has to go to the full-sized, moving printing press that I found out was created from scraps, a found broken wheelchair, and a broken recliner, showing this design team knows how to use their resources. It’s worth mentioning Costume Design by Amy Rudia that also takes us back to 1899 New York. This design is hands down perfect for this production and Rudai’s attention to detail is superb and her ability to wardrobe such a large cast is commendable. A round of applause should go to Rudai for her work and authenticity in design. Henry Cyr takes the helm of this production and his Direction is exemplary. The pacing is on point and Cyr has a tight grasp on this material. 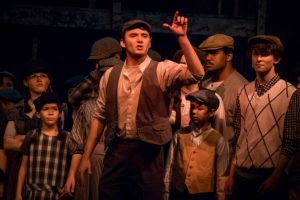 For such a large cast, his staging is near flawless, getting folks on and off stage smoothly, as well as near-seamless transitions that are quick, keeping up with the pace of the entire show. Kudos to Cyr for a job well done. Commenting on the performance of this piece, I’d love to mention every ensemble member, but with it being an extraordinarily large ensemble, you’d be here reading all night, however… I’d like to mention that this is a tight ensemble and every single member held his or her own making for a terrific performance, overall. They kept up nicely with ballet-heavy choreography by Cecelia, Lucy, and Maia DeBaugh which is intense and energized and absolutely required for this piece. Bottom line – the DeBaughs have hit the nail directly on the head with this production. Along with the choreography and staging, Music Director W. William Zellhofer is outstanding. Honestly, this is some of the best vocalization I’ve heard on the Third Wall Productions stage to date. He has familiarized himself with this score and has his cast sounding phenomenal, especially in group numbers such as the fun “King of New York,” and the inspiring “Seize the Day.” Zellhoffer should be applauded for his work and efforts. Speaking of music, a special mention must be made for the musical stylings of the superb orchestra consisting of Andrew Zile (Conductor), Ed Berlett (Piano), W. William Zellhofer (Keyboard), Jonathan Goren (Violin), Alice Brown and Sharon Aldouby (Cello), Kevin Jones (Bass), Winfield Clasing (Drum Set), merrell Weiss and Matt Elky (Reeds), Matt Elky and Dan Longo (Clarinet), Liam Slowey (Percussion), Richard Sigwald (Trumpet), and tony Settineri (Trombone). Congratulations to this entire orchestra for a job very well done. To mention a few, there are definite “adult” and “child” characters, Joel Signor takes on the role of Pulizter, the villain in this particular piece, and though he gives a good portrayal, he seems a bit stiff and, vocally, he could use a little more umph, but a good performance, overall. His cronies, including H. Ray Lawson as Seitz, Kirsten Mackin as Hannah, and Forest Deal as Bunsen, are adequate, but seem a little lackluster in their performances as a group. Their featured number “The Bottom Line” left a little to the imagination, but they seemed to know their roles and are comfortable in them. 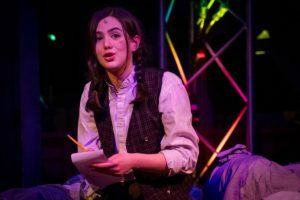 Lizzy Jackson Fleishmann is charming as Miss Medda Larkin, one of the only adult characters who cares for the newsies, and she shines in her performance of “That’s Rich.” Her comprehension of this character shows in her portrayal of this kind-hearted character. Logan Snyder takes on the role of Davey and Bailey Gomes portrays his little brother, Les. Snyder’s portrayal is spot on and he gives a solid, confident performance. Gomes, too, gives an admirable performance as the “cute little brother” with a lot of one-liners that are hit with good comedic timing for an actor so young. 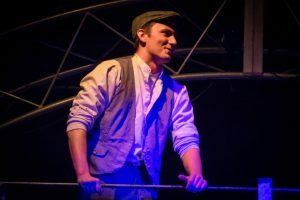 Taking on the role of Jack Kelly, the hero, is Andy Collins and his performance is near perfect. He knows this character and keeps him consistent throughout. Vocally, Collins stays strong, but does seem to lose some steam by Act II. Regardless, his character work and vocal skills are showcased and delightful to experience, especially his renditions of the popular “Santa Fe” and the poignant “Something to Believe In,” a duet with Jamie Williams, who takes on the role of the staunch, but caring Katherine. Williams is well suited for this role and plays the role well, though it seems a bit stiff in some scenes. Vocally, Williams holds her own quite nicely, but her belt is exceptional and makes up for any minor issues she may have with, otherwise, when a belt is not required. Both Collins and Williams have great chemistry that makes it easy to believe these characters and their relationship and makes their performances highlights of this production. A standout in this presentation is Sarah Mackin, who takes on the role of Crutchie. The audience is supposed to feel for this poor character and Mackin seems to be able to get this reaction naturally. Her delivery of the dialogue is fantastic, carrying a stero-typical New York accent consistent throughout and her physical work, though minimal, is brilliant and consistent, as well. In her featured number “Letter from the Refuge” is emotion-filled with bits of humor, and her performance is top-notch. Vocally, Mackin is strong and her voice rings out throughout the theatre making the audience take notice. Her interaction with the rest of the cast, especially Andy Collins, is authentic and she gives a solid and assured performance. I’m looking forward to seeing more from this young actress. 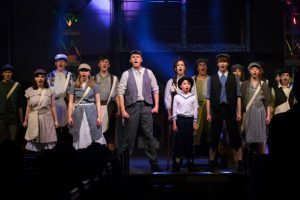 Final thought… Disney’s Newsies is a fun, high-energy production that is full of great music and fine performances. Though it’s a lesser known Disney feature, as compared to most, it’s got quite a following and the musical version is a definite recent theatrical hit and Third Wall Productions has taken on the daunting cast of presenting such a popular piece, but they make good… strike that… very good on their successful attempt. The entire ensemble gives 100% effort and the staging keeps the audience engaged. It’s polished and well-put together production that is not to be missed! 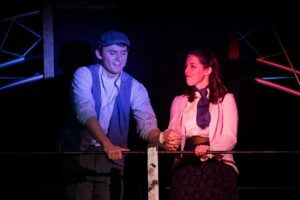 This is what I thought of Third Wall Productions’ production of Disney’s Newsies… What did you think? Please feel free to leave a comment! 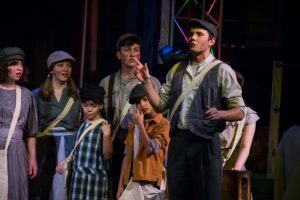 Disney’s Newsies will play through February 17 at Third Wall Productions, St. Thomas’ Episcopal Church, 1108 Providence Road in Towson, MD. For tickets, you can purchase them at the door or online. Like Backstage Baltimore on Facebook!